※ SIHF is an event where handmade creations are curated and introduced. Those creations unfit for the exhibition will be rejected during the application acceptance process. ※ If the deposit is not paid within a week after the approval, your application will be cancelled. ※ When making a transaction, please be sure to keep the name of depositor identical to the company/brand name of your application form. - The secretariat has the right to select locations. Corner booths are not available upon request. - If you are allocated at corner booth, there are only two booth walls that will be provided. Please check your allocated booth. * Other types of participation are also opened such as live painting, performance and running workshop. * Booth Image shown in this page may not be exactly identical to the real. - SIHF is an event that curates a variety of handmade works and introduces their creators. - The secretariat will not accept more than certain number of teams if their items are of the same kind, to avoid concentration of certain item and introduce a variety of handmade works. - The secretariat may reject works or activities unfit according to its regulations. If the number of applications for certain items are deemed to be excessive, the secretariat may stop accepting applications before the deadline. Article 1 Definition 1. "Exhibition" refers to ‘Seoul International Handmade Fair 2019’. 2. "Organizer" refers to 'Living & Art Creative Center(LACC)' and 'Seoul Design Foundation.' 3. "Exhibitor" refers to individual(artist), company, organization or group applied for the participation in this exhibition. 4. "Booth Fee/participation Fee" refers to the cost of hiring the booth including VAT and additional(equipment) fee is excluded. 5. "Total participation Fee" refers to the sum of "Booth Fee" and"Additional Fee" including VAT. Article 2 Exhibition application and agreement 1. The one who wish to participate the exhibition shall fill the application form, receive approval from the organizer and pay 50% of the total participation fee by bank transfer within a week from the approval. 2. If the application is submitted and 50% of participation fee is paid but the organizer doesn’t give an approval for the harmonious composition and smooth progress of the fair, the contract is invalid. The participation fee that has been already paid will be fully refunded in this case. The commission fee for bank transfer in this process is the resposibility of the applicant. 3. 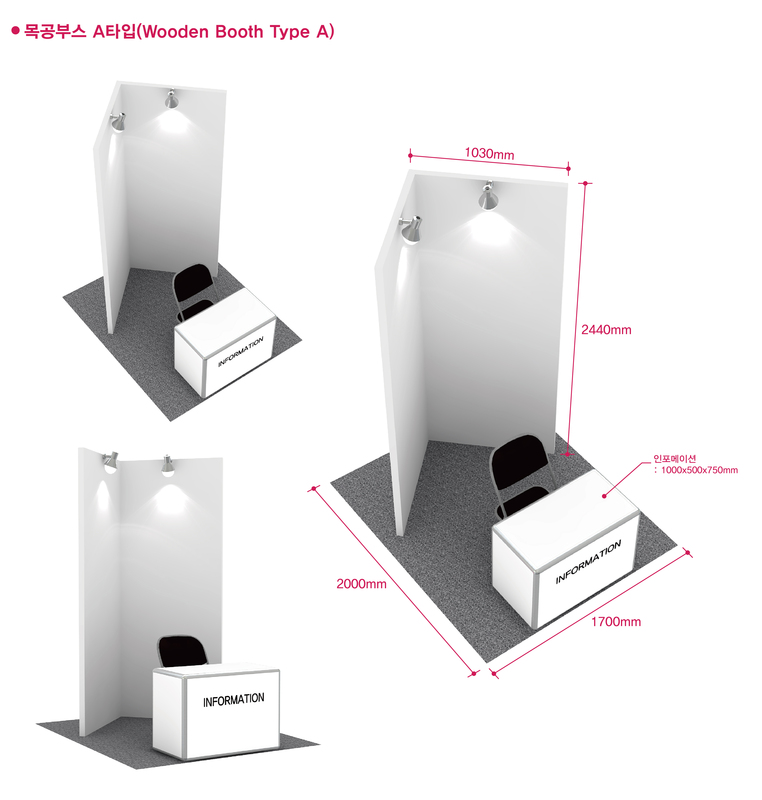 Booth fee is 630USD for wooden system A, 1,630USD for wooden system B and 1,710USD for raw space. (VAT included) 4. Technical support and standard package construction will be provided by the organizer upon the request of the exhibitor. In case of any alternation in technical support request, the exhibitor shall inform the organizer in prompt manner. Any disadvantage occurred by the non-inform is subject to the exhibitor’s responsibility. 5. The organizer must be notified immediately of any changes to the application form of exhibitors. Exhibitors will be responsible for any disadvantage arising from a failure to notify. 6. Method of Payment Bank Name : KEB HANA BANK Account No. : 77191002045404 Account name: Living and Arts Creative Center Bank Swift Code : KOEXKRSE Bank Address : 66, Eulji-ro Jung-gu, Seoul, Korea (DN 04538) / LACC Address : 2F, 84-5, Seongmisan-ro 13-gil, Mapo-gu, Seoul, Korea  Article 3 Assignment of Exhibition Booth 1. 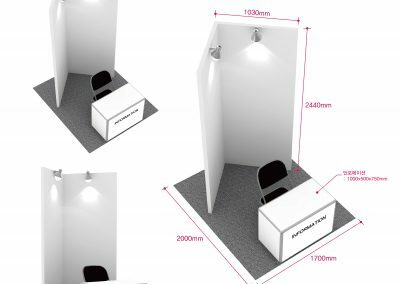 Organizer has all rights to the booth assignment and Exhibitor may not object to the decision made. According to application and payment order, booth will be assigned considering country, item, size, exhibition results and other reasonable matters. 2. 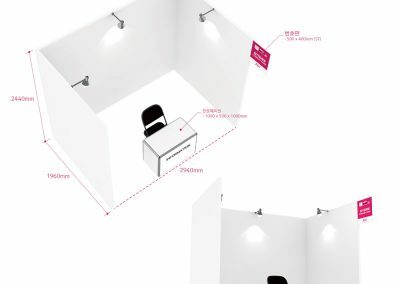 The organizer may change the allocated booth location in case the organizer acknowledges the necessity considering spacing harmony, viewing efficiency and exhibition effectiveness. Such change is under discretion of the organizer, and the exhibitor shall not object on the decision. Article 4 Exhibition Management 1. Exhibitor shall display the items listed in the application and have someone to take care of the booth at all times. 2. Exhibitors must comply with the exhibition hours. The organizer may claim damages against exhibitors who fail to properly manage their booths, such as by failing to comply with the exhibition hours or leaving their booths unattended. 3. If the Exhibitor displays items not listed in the application or if displayed item does not fit the nature of the exhibition or conducts direct sales without approval from the Organizer, Organizer can request to stop, withdrawal or dismantle. This case, participation fee is not refundable and Exhibitor may not ask for compensation. 4. Organizer may prohibit certain people from the exhibition, if necessary. 5. Exhibitor cannot use other area for the exhibit without prior approval from Organizer. 6. Exhibitor cannot use speaker or amplifier without prior approval Organizer and sales or loud activities are strictly prohibited. Exhibitors causing excessive noise or disrupting the operation of nearby booths must cease upon request from the organizer to do so. 7. For any damages that cannot be returned into original state, such as painting the floor/ceiling/wall, Exhibitor is liable for any reasonable compensation requested by Organizer regarding the restoration. Article 5 Payment 1. After submitting application, the exhibitor shall make an initial payment of 50% of the total participation fee whithin a week from the approval and the balance shall be made before March 5(Tues.) 2019. In the case of submitting the application after March 5(Tues.) 2019, 100% of the participation fee shall be paid right after receiving the approval of the organizer. 2. In the event of Exhibitor not making the balance payment within the designated deadline, organizer may cancel the contract and the Exhibitor cannot ask for refund. The matter will be resolved according to Article 6 of this Rules and Regulation. Article 6 Termination of the Agreement (Exhibition Cancellation) and Penalty 1. The Exhibitor cannot assign the contract, sub-let or part with his site or stand or any portion of it to 3rd party without prior written consent from the Organizer. If the Exhibitor breaches this term, exhibition can be cancelled and the fee will not be subject to refund. 2. If the Exhibitor does not pay the participation fee with in the designated period, 14 days notice will be given to him/her to make the payment and still if the payment is not made, Organizer has the right to cancel the exhibition contract. In this case, Exhibitor is not entitled to refund. 3. In case the exhibitor cancels or refuses the whole or partial space which is already registered, due to own reason(such as difficulty obtaining a VISA), the exhibitor shall inform the organizer in document and pay the penalty that is settled below within 14 days. Penalty is deducted from the paid participation fee, if not sufficient, the exhibitor shall pay the addition, and if surplus, the balance will be returned. <Cancellation Penalty> - Cancellation occurs more than 2 months ahead of the event (prior to March 5, 2019): pays 50% of participation fee as penalty fee (This means the down payment which is 50% of total participation fee, is not refundable at any causes) - Less than 2 months ahead ( March 5 - April 16, 2019) : 80% of participation fee - Less than 1 month ahead (April 16, 2019~) : 100% of participation fee (*Booth fee includes all costs, such as creation of a directory, advertising, promotion, site and other preparations, etc.) 4. This penalty does not include VAT, and no tax invoice will be issued. Any bank fee for transferring the funds are the responsibility of the payer. Article 7 Cancellation of Exhibition or Alteration In the event of cancellation or date change of the exhibition due to irresistible force or other causes not resulting from the Organizer, already paid exhibition fee will not be refunded and Exhibitor may not ask for compensation. Article 8 Display of items 1. Exhibitor shall complete installment, entrance and display of the item within the designated date. In case of items not being displayed until 8 pm, May 15(Wed), 2019, Organizer has the right to temporarily cancel that exhibition and ask for compensation. 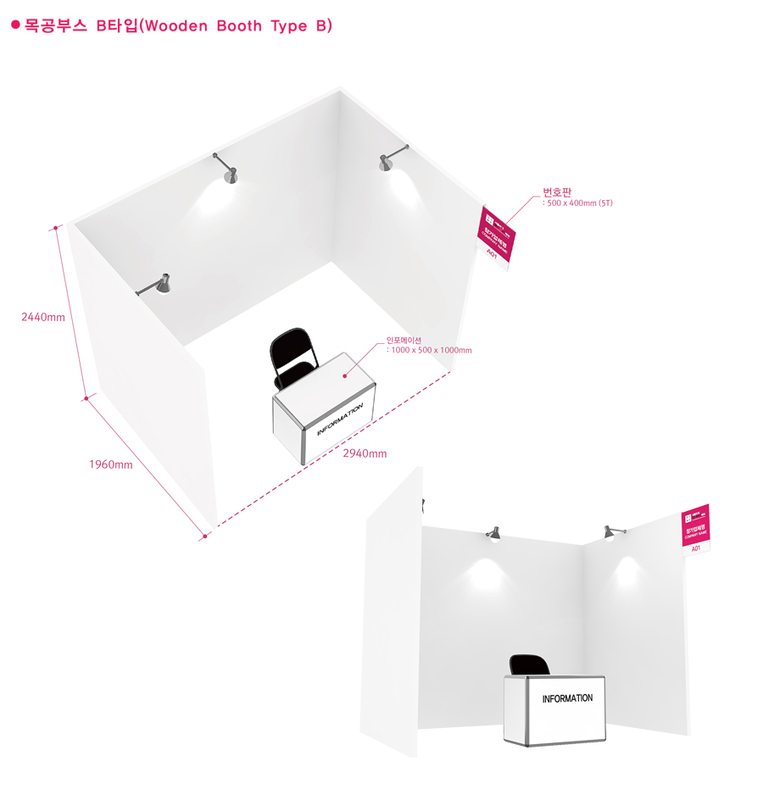 (※ If a participant wishes to exhibit his/her items after May 15(Wed), 2019, the organizer must be notified in advance . The participant shall be responsible for any disadvantage arising from a failure to notify.) 2. Installation can be made from 9 am to 8 pm. If additional working hour is required, additional work application shall be submitted and extra charge shall be made. 3. Opening and closing time of the event must be kept follow by exhibitors strictly, and preparation should be done on time during the exhibiton period. Article 9 Restoration After the exhibition (May 19th Sun 2019, 6pm-10pm), Exhibitor shall restore booth space to the original state. Exhibitor is liable for any expenses/losses, including additional charge caused by delay, arising to the Organizer from a delay of dismantling. Article 10 Security and Safety 1. Organizer shall take proper action (DDP’s exhibition regulation) to secure safety for the Exhibitor and visitors. 2. Exhibitor is fully liable for any damages or loss occurred during the exhibition preparation period, exhibition period and dismantling period. 3. If Exhibitor intently caused fire, damage, loss or other accidents causing loss to Organizer or any 3rd party, Exhibitor is fully liable for the cause and insurance regarding all materials and items. Article 11 Fire Safety 1. All materials and items must be fire resistant according to the safety regulations. 2. Organizer may ask for modification regarding fire prevention to the Exhibitor if necessary. Article 12 Amendment 1. The Organizer reserves the rights to modify at any time the provisions of the present Rules & Regulation; the Exhibitors shall comply with the modification. 2. The Exhibitors must comply with the regulations of DDP. Article 13 Disputes In any disputes that may arise concerning interpretation of the present Rules & Regulations, the Exhibitor agree to the competence of the Commercial Arbitration Rules of the Korean Commercial Arbitration Board and shall not bring a law-suit against the ruling. Please include introduction of your resentative goods (please keep it short). The organizer will continue with the approval process after reviewing applicant photos and websites. Please be sure to keep the name of image file identical to the artist(company) name. * Raw Space _ Organizer provides only exhibition space, should be applied at least 2 spaces [Introduction to the corner booth] - The secretariat has the right to allocate select locations. Corner booths are not available upon request. - If you are allocated at corner booth, there are only two booth walls that will be provided. Please check your allocated booth. ※ Please double check your selected booth type. Promotion rate is different based on the booth type. * You should check 'the booth information' on the website for checking the basic offer included in the booth fee. * Fabric for the desk SHOULD BE prepared individually. * Except the list above, you should prepare the other items you need for the exhibition on your own.